Tournament in December, but only if they can get there. The team is fundraising flat out to cover the weekend’s expenses for the group of 17 and because they have no sponsors, every cent is raised by the team and their families. To cover the $900.00 entry fee, the team delivers the Te Atatu Views magazine, rain or shine, dividing up the streets between them. But they still need to find enough funding to cover accommodation, food and transport for the weekend – for 17 players. 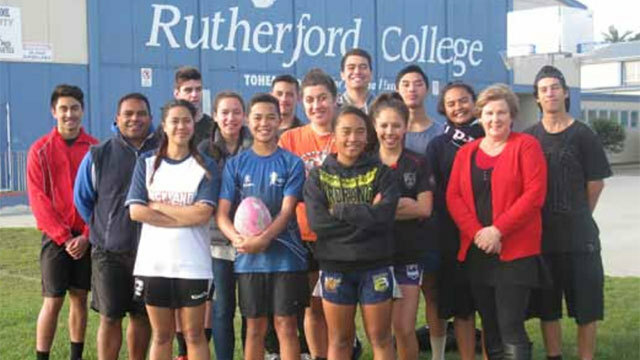 Manager Maxine Tipa says the annual tournament is organised by Touch NZ and attracts more than 60 teams from all over the country. But the Rutherford College team has high hopes. Maxine says Coach Hugh Reu does a great job of shaping the team and he does it all voluntarily. “They’re an awesome little team, and there are some great talents including three rep players. We’ve got no sponsor at this stage, but we’d love one,” she says. Right now the team is also trying to raise enough funds for training shirts, although the College will provide uniform shirts for the tournament. They’ve held a BBQ at Mitre 10 and another BBQ with a touch tournament, and they will keep fundraising to reach their target. (Hugh Reu (Coach); Paxton Malingi; Malissa Tagaloa; Lydia Turua-Quedly; Alysse Abraham; Tyler Tamati.